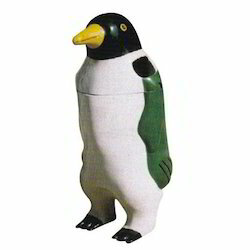 We are offering Penguin Dustbin to our clients. MADE OF FIBRE UNBREAKABLE-REPAIRABLE, WATERPROOF WITH DECO PAINTS. We are offering a wide range of Penguin Bin to our clients. - stunned mats of repute company. - FRP doors of 3 mm thickness for outlets. Usage: Public Places For Keeping Garbage in Parks, Restaurants, Malls, Banquets etc. Door given at the back to collect the garbage. 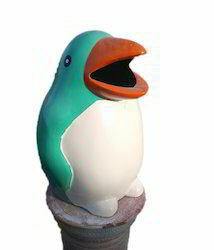 We are conspicuous home that is engraved in manufacturing and trading of a vast range of FRP Penguin Dustbin for home, schools, gardens and public place to keep clean atmosphere. Attractive shape instants people to not to throw waste other than dust bins.